Lemon Berry Tarts make a great breakfast, brunch, or snack! 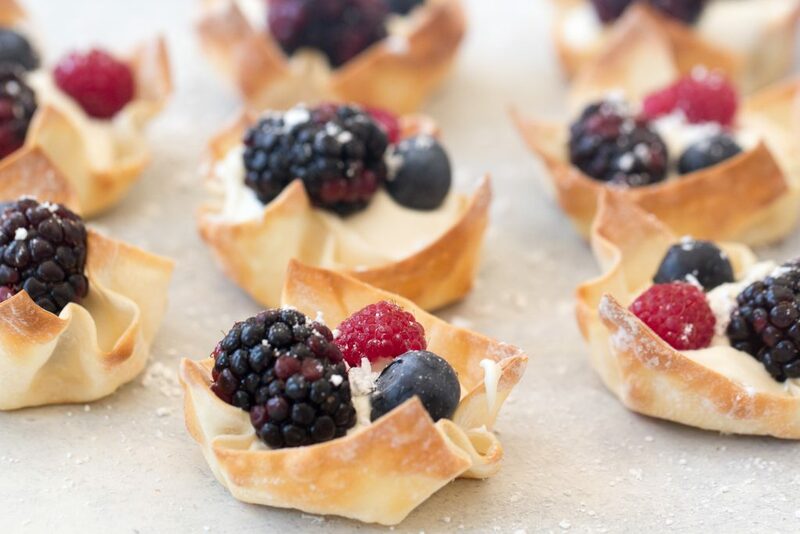 Using wonton wrappers, lemon custard, and fresh delicious berries, you won't be able to resist this fresh and fruity treat. These Lemon Berry Tarts are perfect for breakfast or brunch. We love having an assortment of fruity treats once the weather starts warming up. Using fresh berries in this recipe gives it such a fresh and light taste. 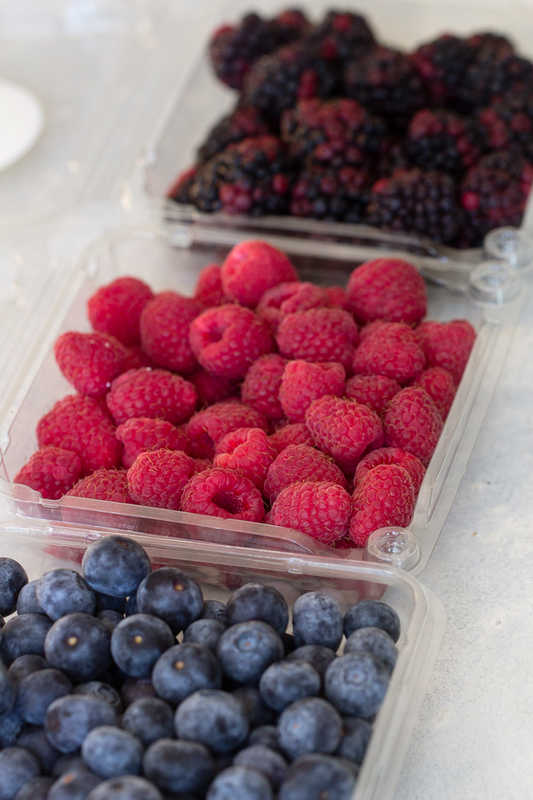 Bring on all the fresh fruit! I have always heard of people using wonton wrappers in pastry recipes but had never actually given it a try. I was so impressed at how easy it was and how perfect the crunchy wrapper went with the delicious filling and berries! Spray a muffin tin with non stick cooking spray. 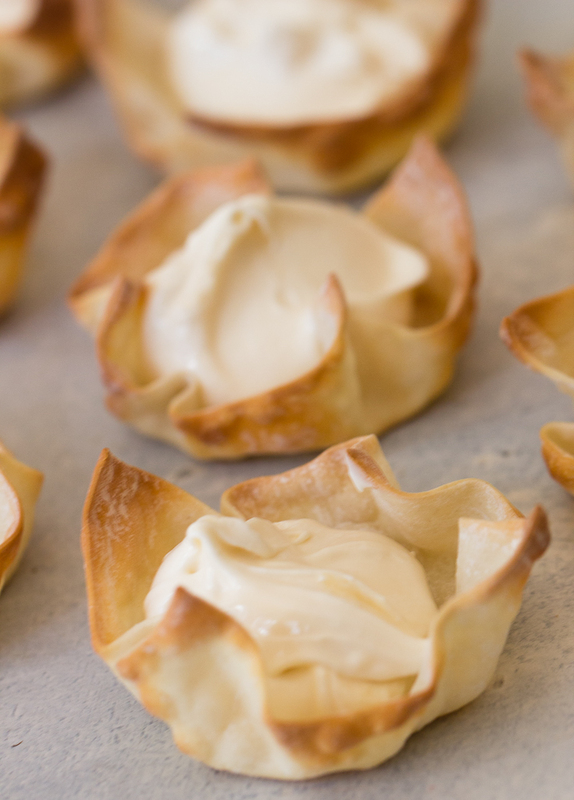 Place wonton wrappers in muffin tin and brush with melted butter. This will give them the crispy edges and shell for your tarts. We recommend using unsalted butter. Bake for 7 minutes or until the edges begin to golden. Watch them closely around 7 minutes, the wonton wrappers are very thin so they’ll go from golden to burnt pretty quickly! We love the fresh taste of lemon in the spring, especially when paired with fresh berries! To get the delicious lemon flavor in this custard filling, we used a lemon pie filling, but any lemon curd or pie filling will work great. Whisk together your sweetened condensed milk, lemon fruit filling, and cool whip to create the perfect creamy filling for your tarts. If you are not a fan of lemon, any flavor of fruit pie filling would work, but we’d recommend sticking with lemon! 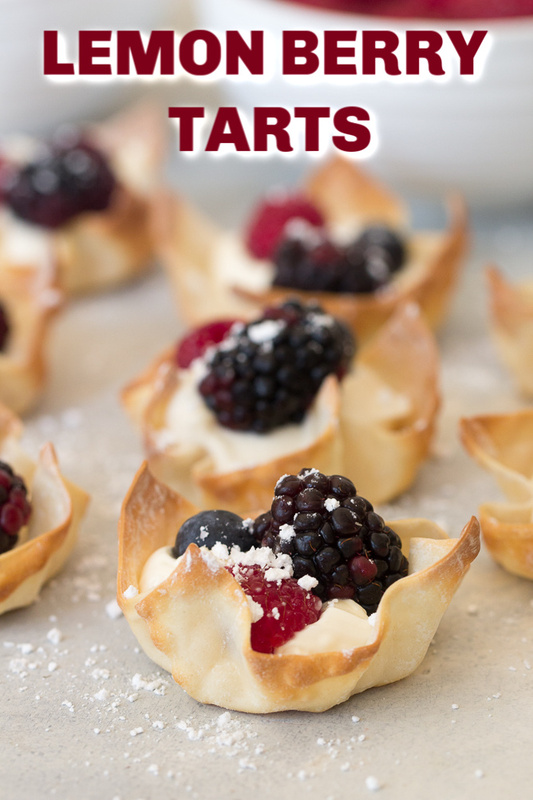 Here’s what you’ll need in your kitchen to make these Lemon Berry Tarts! Muffin Tin – We used a regular sized muffin tin for this recipe. You could use a 6 count muffin tin if you’re cutting the recipe down. However, we do recommend a non-stick! Basting Brush – These basting brushes are perfect for brushing butter onto your wonton wrappers. You’ll use these WAY more than you’d ever expect to in the kitchen! Silicone Whisk – A good silicone whisk is a MUST when whisking together anything creamy like our lemon custard filling in these tarts. So easy to clean, so flexible, and sturdy. 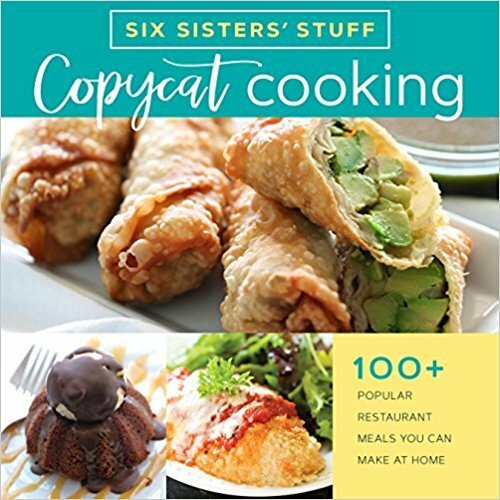 Looking for more brunch recipes? Here are a few of our favorites! 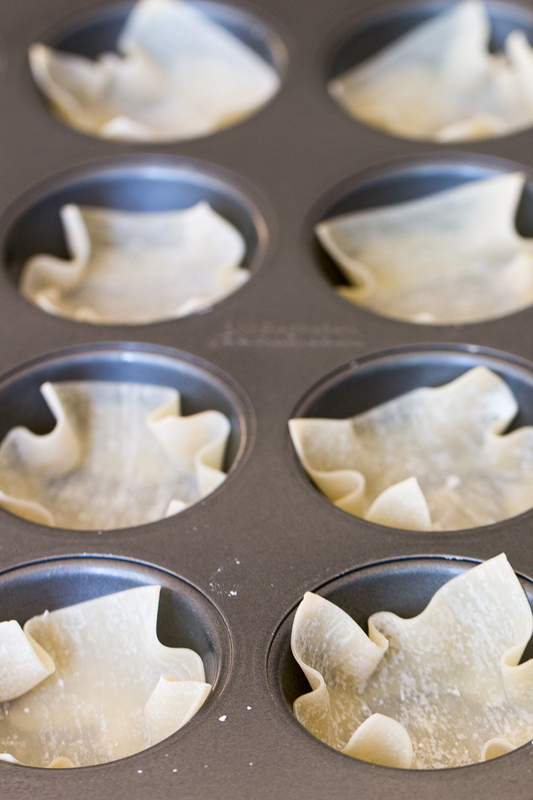 Place wonton wrappers in nonstick muffin tin, and lightly brush with butter. Bake for 7 minutes or until wrappers begin to turn golden brown on the edges. Whisk together sweetened condensed milk, whipped cream, and lemon filling. 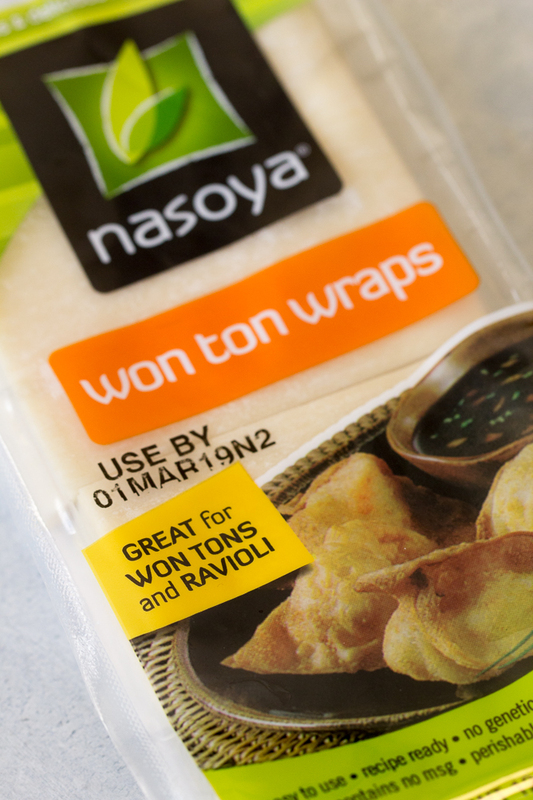 Once wonton wrappers have cooled, pipe filling into wonton wrappers, and top with your favorite berries. In this video, we’re showing you how to make another one one of our favorite brunch recipes, Pecan French Toast! Sounds wonderful! Gotta make these. One question: you mean whipping cream, right? Can you tell me if these are made in the mini muffin tins with 24 on the sheet or in 2 -12 muffin tins? We made these in regular sized muffin tins. Is it whipping cream or cool whip? Recipe says cool whip. Hope this helps. I cannot find the fruit filling. Can lemon curd be used in place of it? That should work, or any lemon pie filling will also work.